I have received product/compensation from One A Day with Nature's Medley to write this post. Regardless, all opinions are my own. It’s no secret that I’ve been making some pretty significant changes to my life and my health over the past few months. In fact, as I’m getting older and watching my children start to mimic what they see me and their dad do, I’m realizing the importance of not only instilling good, healthy habits but of doing so through leading by example. I’m becoming more and more aware of the fact that the habits and values I’m raising them with will spill over into their adult years and help shape the way that they look at living a healthy lifestyle. With this in mind, I’ve been taking the changes I’m making and trying to find ways to involve the whole family in living a healthier lifestyle. While I’ll admit that we’re not perfect, we’re discovering that with three simple changes that we came make together, we’re working towards a healthier lifestyle that we can all feel good about. Now, I’ll be the first to admit that sometimes, making changes for the better can be difficult. But it’s always easier when you have a support system in place and since I spend more time with my family that anyone else in my life, it only makes sense that I’d implement healthy changes with them. After all, they are the ones that I want to enjoy life with and that’s so much easier when you feel great. However, the real key for us has been to make small changes together to improve our family’s overall health. Want to know what I mean? Check out these three simple changes we’re making each and every day to impact the way we feel! So many times, people think getting active means going to the gym. While that’s fine if that’s your thing (it’s totally not mine! ), there are so many great ways to get active as a family! My family loves to take walks together. 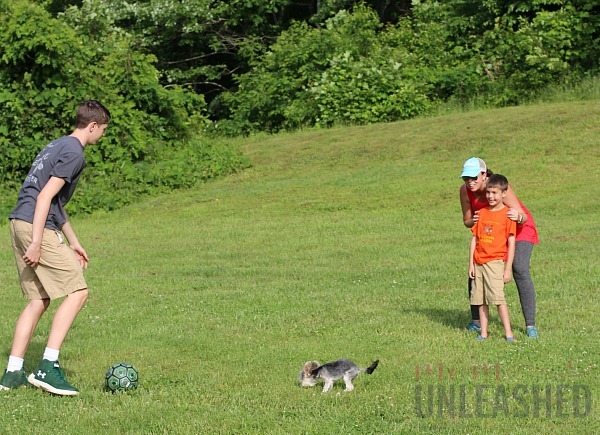 We adore playing soccer or football in the backyard. We go hiking or swimming on the weekends. Truthfully we just love being outdoors and the options are endless when it comes to getting active together! In fact, the truth of the matter is, if we’re moving and having fun, we’re doing exercise right! encourage you to make exercise fun and inclusive for every member of the family and I can guarantee that it will never feel like a chore to find time to be active each and every day. I’ll be truthful….I have a picky eater! It takes work for me to get him to eat well balanced meals that I can feel good about. Does that mean that I just give up? Some days I might want to but with a little simple planning I’m able to find fun and creative ways to at least work some fruits and veggies into his favorite meals. By getting creative in the kitchen, I can “hide” veggies in a variety of recipes like spaghetti or even cauliflower rice! 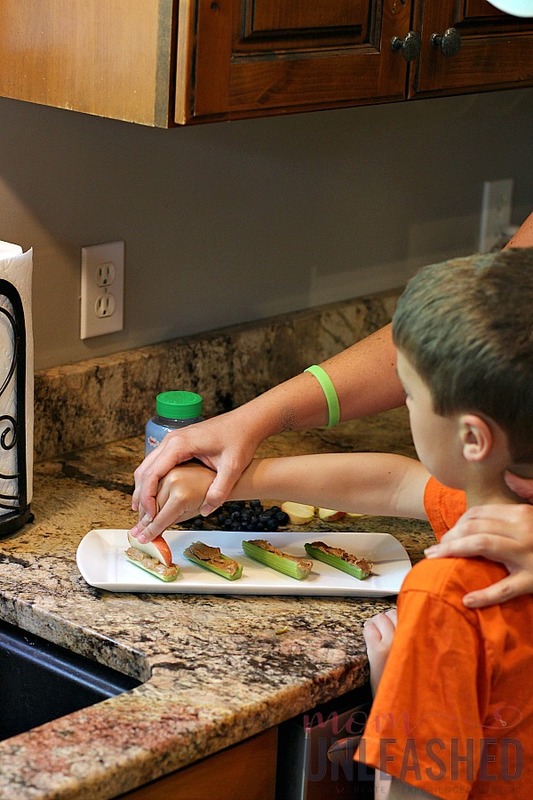 My entire family likes to get on board and see how we can take fruits and veggies and present them in new and delicious ways that are fun to eat! An even simpler option that often works well is making snacks fun. 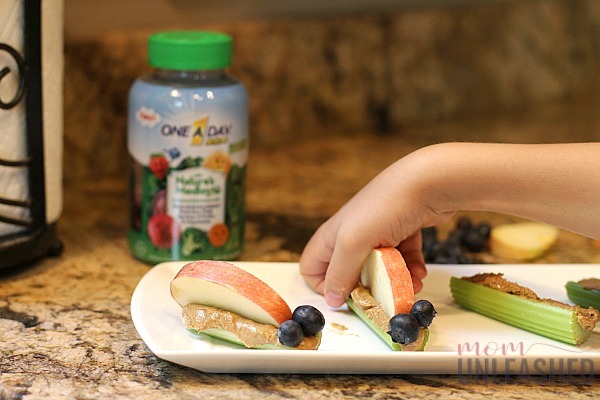 One of my favorite ways is by creating apple caterpillars with celery, apples, blueberries and almond butter! 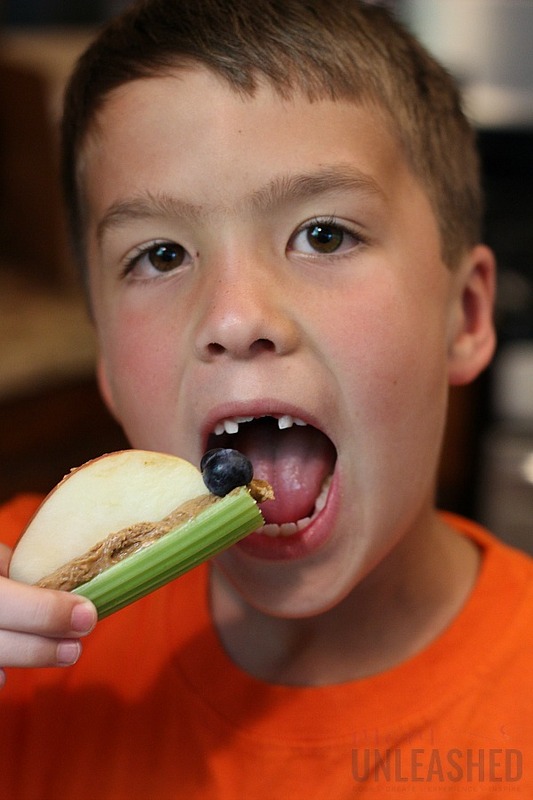 It’s a quick and easy snack that fun for kids of all ages and truthfully, us adults like it to! With a little planning and a little creativity, I’m discovering that while sneaking in better foods can be challenging, it can also be tons of fun for the whole family! While the above changes take a little bit of effort, there is one simple change that everyone in my family adores and that takes little to no effort at all and that’s adding New One A Day with Nature’s Medley to our daily routine. These are the only complete multivitamins that contain plant-based antioxidants from one total USDA serving size of fruits and vegetables. The kids love that they are delicious (OK, who am I kidding, the hubs and I love that as well! ), and I love that I’m able to give them the antioxidants from one total serving of fruits and vegetables in a form they love. While I do everything I can each and every day to make sure my whole crew eats right, there are just days that it doesn’t happen. I know I’m not alone in this struggle because statistics show that up to 90% of Americans fall short in getting the key nutrients they need from food alone and 94% of kids don’t meet their daily fruit and vegetable recommendations. But when our veggies don’t quite disappear at dinner or we’ve made less than perfect choices on what to eat, I can feel great knowing that I’ve got a way to give my entire family the nutritional support they need in a form that they love. Unlike the resistance I often get with pills (have you ever tried to get a seven year old to swallow a pill? 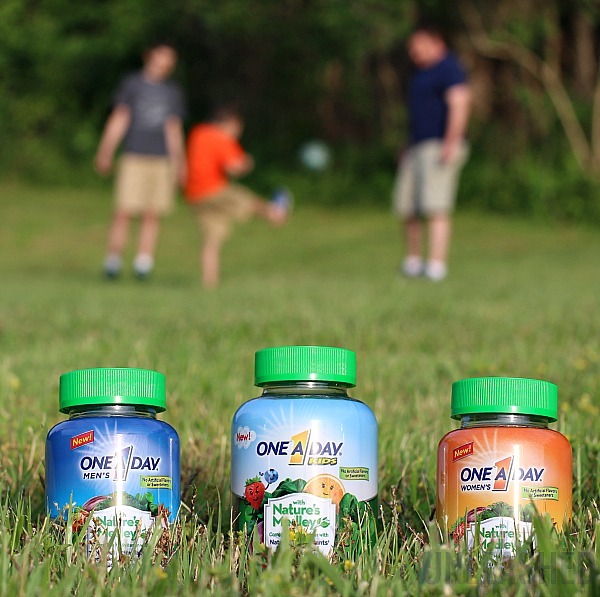 ), when I present New One A Day with Nature’s Medley gummies that are free of artificial flavors and sweeteners and derive their colors from natural sources, I know that my whole family will feel as good about taking their daily multivitamin as I do about giving it to them. While I know that my family will never be perfect and we will always have room for improvement, especially when it comes to our eating habits, I love knowing that I can do one great thing every day by giving my entire family New One A Day with Nature’s Medley. 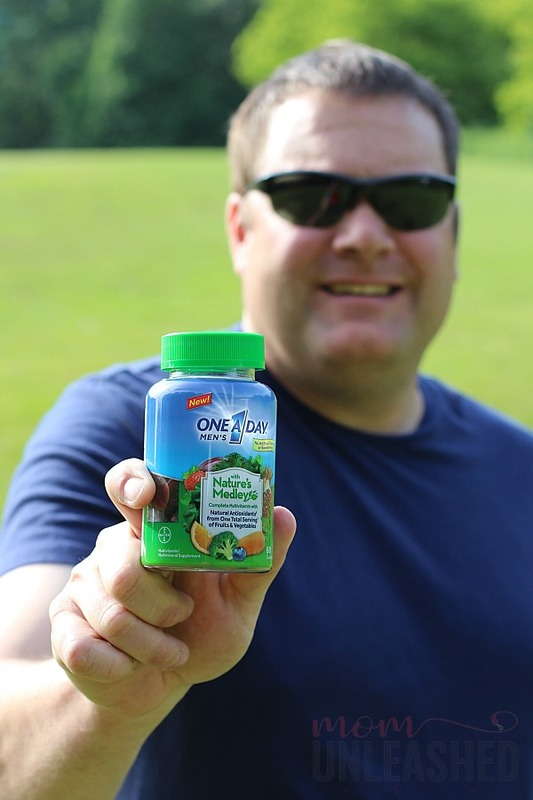 Are you ready to add this daily multivitamin that contains the plant-based antioxidants from one total USDA serving size of fruits and vegetables to your family’s daily routine? I’m sure you are and right now is the perfect time to do it! 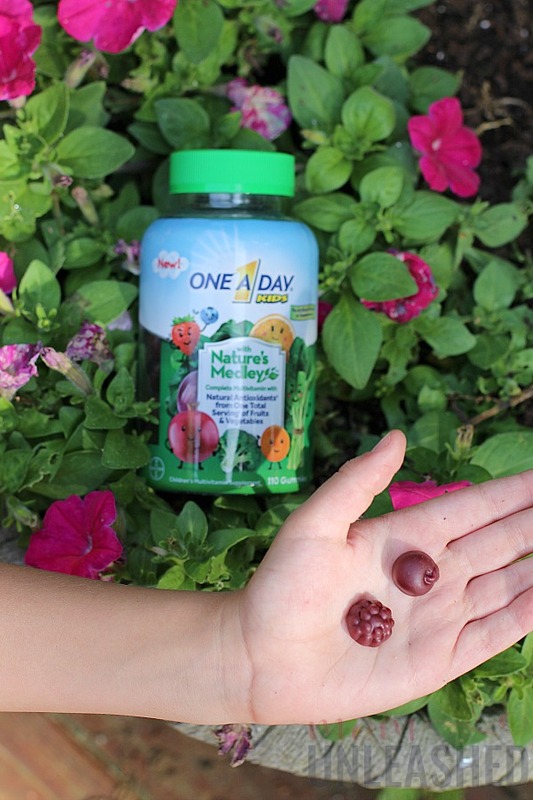 One A Day with Nature’s Medley multivitamins come in three different varieties that are uniquely formulated for Men, Women and Kids and they are now available at Walmart! Head in store today and look for them in the pharmacy section with the One A Day vitamins that you’ve known and loved for years! Then if you only make one change to your family’s lifestyle today, make it a change that counts and start giving every member of your family New One A Day with Nature’s Medley! Now tell me, in addition to adding New One A Day with Nature’s Medley to your family’s daily routine, what are some simple changes you make as a family to stay healthy? Visit my link for a $4 off coupon today! Going to the gym is not my thing either. I had much rather be outside walking, gardening, riding my bike and playing with the kids. I’ve been trying to improve my health as well and these changes are so doable! I have for the most part banned packaged foods and we’re snacking more on real and fresh fruits and veggies. Vitamins are taken each morning also. I need to pick up Vitamins for my family and yes, I need to make better choices when it comes to snack. As for getting us up and moving that is something I need to do because my son has gotten to where he doesn’t want to go outside because I don’t. Having a vitamin for the family is perfect and works well. We keep fruit and vegetables ready to go in the refrigerator. Just don’t buy the junk food. These sound great! I do take the One A Day Womens, so I’ll look into these for sure! We do try to go out and be active as a family. I think that’s important. We were just at the beach, and that was fun. We also try and set a good example for our kids and we exercise every day. We have never tried these vitamins but they seem like a good idea. I am the worst with vitamins which is such a simple to improve one’s health. You are making me motivated to buy a bottle of One a Day on my next shopping trip! My mom must be very lucky since she did not have to hide veggies in our meals. Instead, the vegetables are always the star and we learned how to appreciate them. We have been working on all of these! I do need to try a new multivitamin though, the one we were taking was just too expensive. I need to look into these One a Days! I love your tips! I try my best to keep moving through out the day. I have to get these supplements for my family. I love the combination of apple and celery. I have to get some almond butter, it’s a perfect choice since my son is allergic to peanut butter. I’m a big fan of One a Day but hadn’t seen the kid’s gummies before. These look awesome! Definitely want to check out for my kids! 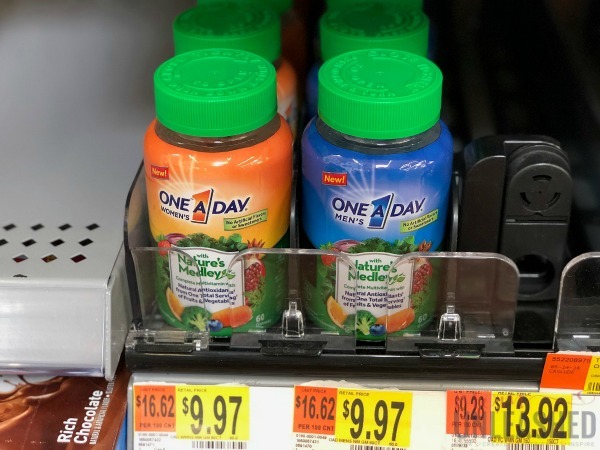 I have always liked One A Day Multivitamins. I have been taking their Women’s brand for a few years. I did not know they had gummies. I encourage my family to drink more water by not buying sodas or juices. It works for me too. I easily drink over 100 ounces a day. We take these too! I love that they are packed with fruits and veggies! These vitamins are definitely something that is easy to do to make sure overall health is better. 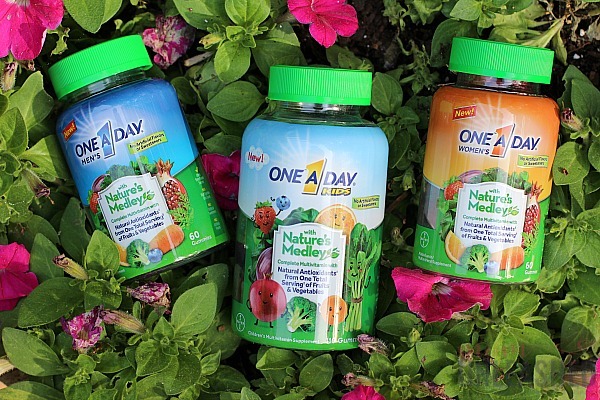 I love the One A Day brand. I love that they have the vitamins in gummy form. They are so easy to take when you are on the go so much. I fully believe in taking a good multivitamin! I can definitely tell on the days I don’t take mine! Multivitamins are so important, I need to try these! I will admit I always seem to forget taking a multivitamin for myself but know I need to make it a habit! In my family, vitamins are a daily routine. Despite the fact that we eat a lot of vegetables and fruits, I’m sure it gives a full range of vitamins for a day.